Candidates who are searching for Admit Cards/ Hall tickets/ Call Letter for various Government Jobs can download them here on this page. We updated all the information related to the Admit Cards such releasing date, official Website, etc.., applicants can check them and download admit cards if they applied for any Recruitment Examination. Admit cards are very important for any Examination. It is a must and should that candidate had to carry their Admit Card/Hall ticket to the examination center. Applicants will not be allowed into the test center if they don’t have to admit card. Along with Admit Card contenders should also take an identification proof along with them. Generally Admit card contains personal details of Candidates like Name of the Candidate, Father Name, Mother Name, Date of Birth, Exam Date, Exam Time, Test Centre and Name of the Examination along with the Photograph of the Applicant. Admit Cards 2019 of various Recruitment are out for download. Candidates who had applied for Particular Recruitment 2019 can now easily download the Admit Card. We also suggest candidates download the Admit Card at least 5-10 former days from the Date of Examination. Candidates can also check our site All India Jobs for other Exam Admit Cards 2019. Mostly, the below details are present in admit card or hall ticket. This page is specially made for admit cards. We tried to upload as much as possible Admit Card’s details which are officially released by the certain state Government/Central government. Candidates can check them all here without the burden of searching other important details related to admit cards. Admit Cards uploaded here are from Recruitment like Banking, Media, postal, Army, Defence, navy, Teaching and other Departments. Candidates are advised to take an extra copy of the Admit Card to avoid complications. To download admit card, you need to open official website link of particular board or organization. Find the corresponding exam admit card link and click on it. 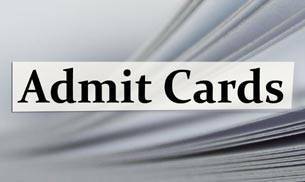 Enter appropriate details mentioned in the admit card link such as hall ticket number, date of birth, etc. Once you filled the details, click on submit button. After clicking on the submit button, your admit card or hall ticket will be displayed on the screen. Just click on download admit card to download it to your computer or mobile. Take a print out of that admit card which is required to attend the examination. CDAC Noida Project Engineer Admit Card Project Manager, Project Engineer, Project Officer & Project Support Staff. GAIL Foreman Admit Card Foreman (Civil, Chemical, Mechanical & Electrical), Technical Assistant, Operator & other posts. Kurukshetra University Admit Card UG, PG, M.phill, Ph.D.
By commenting below on the comment section. And for current exam admit cards candidates can always check our site All India Jobs. We also advise candidates to bookmark this page to check the latest updates related to Admit cards of all govt exams in India. Me.ram Narayan rawat.daman me Panchayat security’s pad Ka pharm bhara hi..eska exam.date.mughe pata chahiye.aap mughe kripa SMS Kar ke pata Kar de. Tell me the what exams will write a mechanical students.tell me that exams and syllabus.Thank you. DGVCL vidhyut sahayak ka call leter kab niklega?